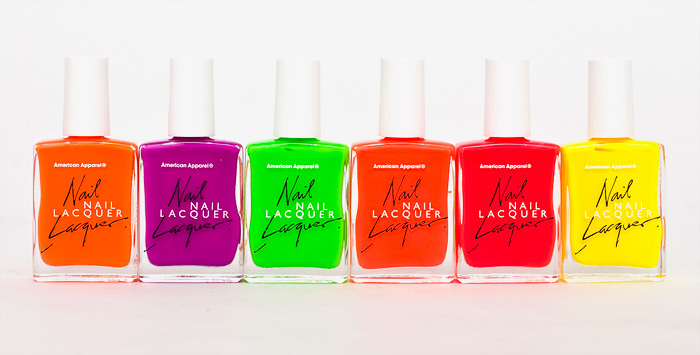 The new shades are: Neon Orange, Neon Violet, Neon Green, Neon Coral, Neon Red and Neon Yellow. Priced at £7.00 each and available to buy online or in store. Up and at ’em! Wow, love the look of these. Especially the neon violet and coral. oh la la! i looove these shades! i have to say, i’m quite afraid of AA nail polishes though. i tried them in store once and they made my nail bed feel funny =/. my nails are quite thing and brittle though, so i’m sure that has something to do with it. Ahhhhhh, my eyes……. actually, my eyes are quite happy. Reminds me of one of my first polishes which was a very dodgy neon green. Happy days! you’re right – they hurt my eyes. strangely compelling though. Just the kind of blinding shades I like come summer time..and they never make me look washed out. Do you know how these apply at all? I’m lusting after them all but mainly the purple, yellow and oranges..I do realise that is nearly 75% of them! Since when did this brand charge £7? I’d like to see the neon red but I wish they’d do something other than cremes. Oh no they’re not available anymore according to the website. It sort of sucked that they were £7 when they’re $6 in the US anywho. I’m looking forward to the neon summer offerings from Dior as a compromise, I’m craving some day-glo for my nails. Holy moly! I bet the yellow and orange will look really good on tanned mitts or dark skin. Wow. Those are quite bright. Not sure I could pull off any of those, including my toes! Maybe the violet. Wow, I love these! They are so bright! Those are some awesome bright colors! I love their polishes (I have two) but £7 is too much in my opinion, especially when the Americans are only paying $6…so I’ll pass. Wowzers! Loving the look of these brights, I agree about the neon red, can’t wait to see these in real life. I live in America and I personally find almost everything American Apparel does offends my eye sockets. ROFL I'm viewing this at work *naughty naughty* and my screen's resolution must be on the maximum because I swear i've just been temporarily blinded, however these shades are fantastically gorgeous! I wish someone would take a photo of them wearing all colours while dipping their hands in a bowl os Skittles.